Now that your bow is together we need to make sure the arrow rest is installed correctly, install a nocking point and adjust the center-shot. It is my recommendation to always install the arrow rest before installing your nocking point. So, let’s start with the arrow rest. There are a lot of types or arrows rests available on the market. 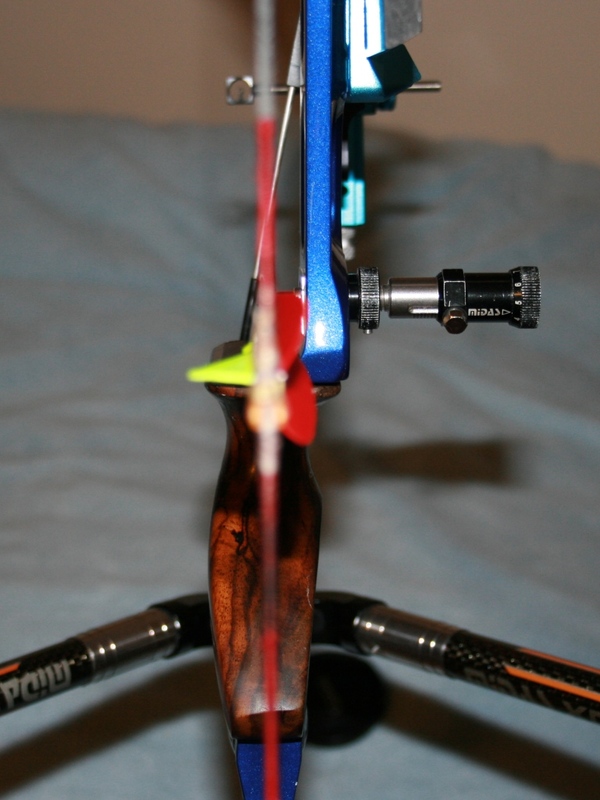 Check out my earlier blog about the various types of arrow rests. For this blog, I will be focusing on the most commonly used one for Olympics style bows, the pressure/plunger rest. The main purpose of the arrow rest is to hold the arrow in place until the arrow is shot. A plunger style arrow rest is designed with a support arm just long enough to hold the arrow, with a slight inward angle to the bow, and it moves out of the way with the shot. They should also be adjusted so that the support arm does not protrude beyond the outside of the arrow. This is to minimize contact with the arrow and minimize impact on the arrow flight. Lastly the arrow rest must be positioned so the plunger/pressure button is square to the center of the arrow. Olympic recurve bows come with a threaded hole for the plunger/pressure button and the arrow rest typically is installed and centered over the hole as the arrow rest and plunger work in conjunction with each other. Note, some risers have two holes and you should use the back one as a starting point which should be directly over the riser’s pivot point. Pivot Point: The deepest part of the riser handle. Alternatively, if your bow did not come with a threaded hole or you are using a traditional bow the arrow rest should be installed at the contact point of the arrow onto the rest directly above the “pivot point” of the bow. You may also want to investigate other types of arrow rests to match your style of bow. Although some recurve archers use a tie-on nocking point, I recommend starting with a simple clamp-on type nock. Clamp-on style nocks are fairly easy to install and simply require your bow square and nocking pliers. Nocking point: The location you attach your nock, it is usually measured 5mm (1/4”) above square from the center of the plunger and arrow rest. Attach your bow square to the string so it is centered on the plunger ( or plunger hole) then measure up 5mm, attach a clamp-on nock, and secure it with nocking pliers. If your arrows are loose on your string, you can consider adding a nock serving for a better fit however once the nock is installed you can begin shooting. For an Olympic archer the plunger (pressure button) is probably the best thing to attach to your bow for fine-tuning. The plunger can be adjusted to help match an archer’s release and counteract a lot of archer’s paradox. For a better understanding of arrow selection, center-shot and Archers Paradox check out my earlier blog. To set your center-shot, set you plunger to the middle and install it in the threaded hole. Attach an arrow to the string, below the nock, and from behind the bow check to see if the tip is pointing slightly to the left (or right for left-handers). Although adjusting the plunger WILL require a trial and error approach, it is important to set the plunger to the middle position using the screw on the end. The amount of pressure setting for your plunger will depend on the archer, the limb poundage and your form. The best approach is to start with medium pressure and adjust accordingly after shooting a couple of arrows (Typically clockwise for more pressure and counter-clockwise for less). Your bow should be basically setup and ready for you to focus on developing consistent form. 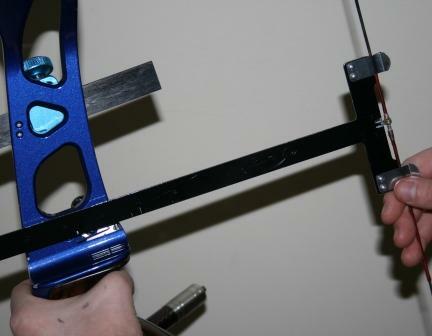 In upcoming blogs I will dive deeper into fine-tuning your bow. Now that you have determined the arrows you should use you need to fine-tune your bow to maximize your arrows consistency. Most people think that once you set up a plunger and a nocking point it is all good to go, however that is not the case. The center shot of your arrow is one of the most over looked things when setting up a bow. The center shot is where the arrow rests on the bow when looking behind it. When setting up your center shot the arrow needs to be completely behind the string. Most traditional bows do not have a cut-away in the riser and the arrow has to deflect around the handle with something called archer’s paradox. Archer’s Paradox: The term was coined by Robert P. Elmer in the 1930s. The paradox refers to the phenomenon that in order to strike the center of the target, the arrow must be pointed slightly to the side of the target. Modern use of the term has caused the interpretation of it to be corrupted and the bending of the arrow is often considered incorrectly to be archer’s paradox. For an Olympic archer, ideally your set up should be 100% behind the string. Some people actually require the arrow lean a little to the opposite side of your riser so that the arrow can get past the bow without hitting it. You can reduce the effects of “Archers Paradox” by adding spin to the arrow by fletching your vanes or feathers with an offset or helical. It is critical that the arrow must have the correct spine so it can bend around the bow, so the fletchings do not touch anything for consistent arrow flight. Therefore, once again I stress, for proper safety and best performance, arrows need to match your entire bow setup.